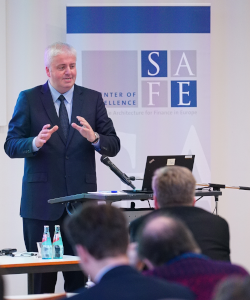 At a SAFE Policy Lecture on 7 February, Bundesbank Board member Burkhard Balz spoke out in favor of a European solution for cashless payment transactions. "From my point of view, it would be time to establish an independent European solution that integrates – where applicable – the strong, efficient national systems,” said Balz in his speech at Goethe University. This would stimulate competition as a whole and strengthen European means of payment and their providers, said Balz. With the ongoing connecting of Europe, the demand for universally applicable means of payment is increasing. However, the Girocard is not equipped for this, as are other national debit cards. So far, customers have only been able to pay abroad with Girocard because it is linked to one of the two major international credit card systems. "We need to set the course for these new SEPA payment procedures now. Otherwise, we literally will have missed the boat," Balz said. Payment transactions, in general, are changing radically. The triad of digitalization, regulation, and competition is putting the established players under pressure," Balz said. According to a study by the Bundesbank, three out of four payment transactions in Germany are still made in cash. "But the truth is also: the proportion of cash is falling every year, and this decline has accelerated recently," Balz said. Alternatives such as debit and credit cards would gain in importance. In addition, a large number of new payment solutions have emerged. Many of these solutions had been initiated by large international technology groups from the USA and China. Those are trying to attract more and more users to their platforms. However, network, scale and interconnectedness effects would facilitate the formation of monopolies. The regulatory and supervisory authorities would have to ask themselves how European alternatives could be maintained or developed. Therefore, a balance needs to be found between efficient and secure payments. Further, for the consumer and merchant choices need to be preserved, as well as data protection. For many successful digital companies, the deal so far has been: supposedly free services for the disclosure of data. "I would, therefore, like to appeal to consumers to take a closer look at how companies deal with their own data," Balz said. From Balz's point of view, the instant processing of payments is of particular importance in competition. In European payment transactions, these instant payments would still be at the beginning. It is particularly important for banks to accelerate processes. "Smaller cooperations here, a chic app there, will not be enough to survive in competition," he said. In fact, they would have to question, deconstruct and reassemble their own business processes. The basis for pan-European instant payments already exists, and since the end of 2017 national clearing systems and a European one have been in place. Balz also referred to the launch of the TARGET Instant Payment Settlement System (TIPS) last November. This would ensure the pan-European accessibility of all institutions and contribute to the fact that instant payments could become the new normal in European payment transactions. "Our goal is to attract as many participants as quickly as possible and thus establish instant payment as a Europe-wide basic process for digitalization in payment transactions," said Balz. Therefore, banks would have to make their internal systems fit for real-time processing. Although some institutes already have fundamentally modernized their IT infrastructure, some still have to master this feat of strength. "Convenient, secure apps or other suitable applications must be available to users in order to initiate or receive payments," Balz said. For a successful distribution, a real added value for payers and recipients needs to come out. "The Bundesbank here also welcomes considerations to upgrade established means of payment such as the Girocard and to design it ‘Europe suitable’ by, for example, using the new instant payment channels for cross-border settlement," said Balz. He was convinced that German and European banks could move closer to their customers with Instant Payments. They could be the basis for Europe-wide payment services that are directly linked to the current private or business account. Balz was open to a "European brand": for him, it is conceivable to develop a kind of label for European payments. "Under one roof, this could indicate that all national cards would be accepted SEPA-wide," Balz said. In the digital era, only products that offer customers a high degree of convenience would prevail. To achieve this, the national procedures would have to be accessible across borders. "If it were possible to establish therefore the European payment brand as well, this would give a strong boost to the competitiveness of the European market," Balz said. Speech by Burkhard Balz (in German): "Der Zahlungsverkehr der Zukunft – wohin bewegen sich Deutschland und Europa?"